ANTELOPE VALLEY – The Palmdale and Lancaster Sheriff’s Stations are in the process of selecting 50 interested residents from the station areas to participate in the Antelope Valley’s 28th Community Academy. The program will focus on the Sheriff Department’s operational procedures, as well as sessions ranging from criminal law to undercover operations. Participants will go on a ride-a-long, tour a custody facility and participate in role-playing exercises. The purpose of the Academy is to build a better understanding between the community and the Sheriff’s Department through education. The class meets for 12 weeks, from March 5 through May 21, 2013. It is absolutely free. Classes will be held on Tuesday evenings from 6:30 P.M. to 9:30 P.M., at the AERO Institute, 38256 Sierra Highway, Suite A, in Palmdale. Due to the limited class room space, only the first 50 applicants will be accepted. You will be notified only if you are selected. Those applicants who are eligible but are not enrolled in the academy class will be placed on a list for possible future selection. If you are interested in this free class or would like more information, contact Deputy Jodi Wolfe at the Palmdale Sheriff’s Station at (661) 272-2520 or email jewolfe@lasd.org. 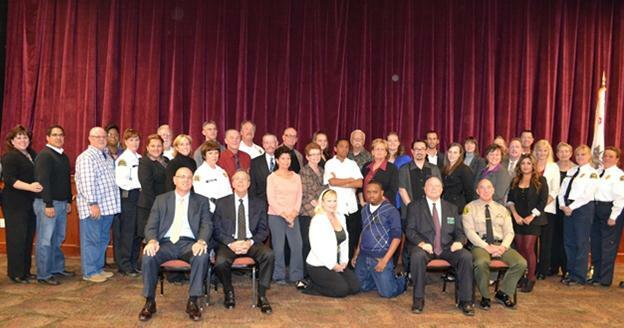 39 participants graduated from the 27th Community Academy in November of 2012. 1 comment for "Take part in the Community Academy"
Great program..I went, I learned, enjoyed the classes and people. Plus I had fun at the same time.